This is my first 3 motor walker. It uses 2 of the rare BG Micro motors, manufactured by Nihon Mini Motor and 1 eject motor from a Minolta camcorder. 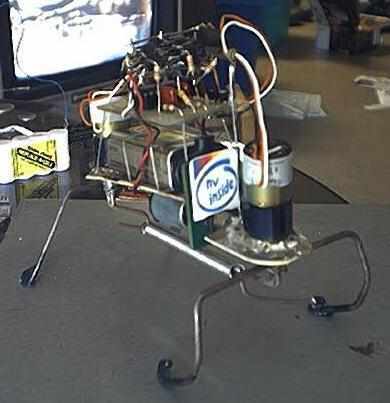 This robot opperates by lifting it's legs while pushing backward. Unlike Walkman Jr, which uses a 4 Nv microcore (Nv stands for Nervous network). The microcore is a loop of Nv units that cycle pulses through to opperate the device and walks by essentialy falling forward, this one will use a branched bicore. The branched bicore has two 2 Nv branches. the first Nv has a delay half of the other neurons. the second is a full lenth delay neuron. What happens is it produces an output that is 90 degrees out of phase. That means that the output signals overlap instead of just loop one after another. Both the microcore, designed and patented by Mark Tilden, and my branched bicore use a 74HC14 schmitt triggered inverter, a resistor, and a capacitor for each Nv. One chip supports up to 6 Nvs, and the branched bicore uses all six. This 3 motor walker is always lifting and pushing forward simultaneously, with out taking any breaks in it's step. In otherwords, it's always moving forward! WAY better than my 2 motor Walkman Jr! 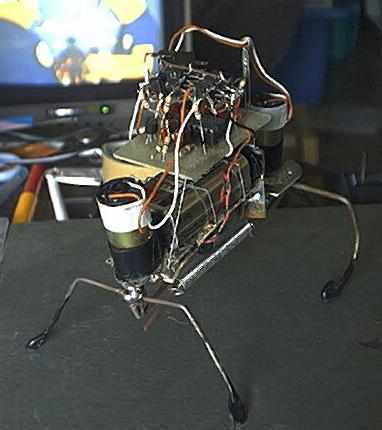 The legs rotate horizontaly,a dn then have a single waist motor that lifts the legs. It's a very simple, but versatile design. The 74HC14 hex schmitt inverter is the most popular inverter for use in nervous networks. They can be chained, or looped. A loop of nervous networks are called a microcore. the inverters are joined by a capacitor, usualy between .1µf and .3µf (I like using .22µf capacitors). A resistor is attached to the inputs. 1 Mega Ohm (M*) is a good value to use with .22µf capacitors. It's easier to alter the value of the resistors than the caps. You can also use potentiometers to bias the microcore. attach the two oustide pins to the inputs of the neurons that drive that motor. Attach the center lead through a resistor to adjust the value properly, and then it to ground. if you attach the microcore straight with fixed resistors, than a fixed resistor on the inputs and to ground. The outputs of the microcore can go to LEDs, drivers, or other devices. In 3M, the branched bicore does the "thinking", obviously. It's out of phase output allows it to simultaneously lift and propel itself forward. The nervous network and microcore are patented my Mark Tilden. It's a realy interesting device. It has many uses! The Motor drivers: I'm using an H-Bridge to drive the motors on this particular robot. The H-Bridge is a rather ingenious design. I don't know who invented it, but it's an excelent design. 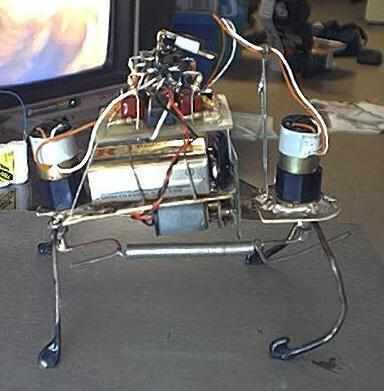 It uses 4 or 6 transistors to route electricity through a motor. There are two inputs. One attaches to one pair of transistors and the other to the other pair. The schematic resembles an "H" (hence the name). When both are on or both off, the transistor with the polarity matching the input activates. In this case, it's equivalent to connecting both wires of the motor to (+) or (-) on the battery. It won't work. If one or the other , but not both, are on, then one side of the motor is routed to (+) or to (-) and the other side remains at it's former polarity. This creates a (+) on one side and a (-) on the other, or vise versa, depending on which line is active. This makes the motor turn one way or the other. By attaching the microcore or a microcontroler to the inputs, you can control a motor. This requires a DC motor, which can be a hacked servo. remove the electronics, but leave the pot and motor (some servos use the pot as the axle for the main gear (one I had did anyway). Attach the driver outputs straight to the motor and the pot can be attached to the microcore (optionaly). The branched bicore is attached to the H-Bridge drivers. There are 6 neurons, and 3 motors (a neuron for each direction the front pair and rear pair of motors can turn. NOTE: the front motor is electronicaly linked to the rear motor, but with opposite polarities).